Only a handful of artists have the cultural magnetism that enables their work to impact our lives, even beyond their musical comfort zone. 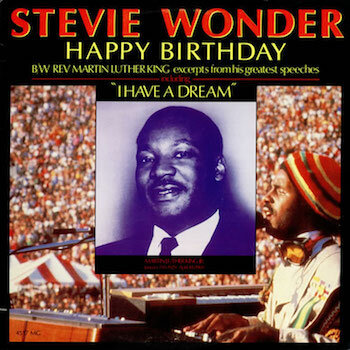 It was Stevie Wonder‘s composition and release of ‘Happy Birthday,’ and his tireless campaigning, that led directly to the enshrinement of Dr. Martin Luther King, Jr. Day, observed in the US for the first time in January 1986 and ever since. The idea for a national holiday to mark the 15 January birthday of the great civil rights campaigner was building in momentum from soon after Dr. King’s shocking assassination in 1968. Several states enacted holidays on his birthday in the 1970s, includiing Illinois, Connecticut and Massachusetts, but Congress stopped short of passing a national day into law. In November 1979, despite the endorsement of President Jimmy Carter, the King Holiday Bill was defeated by five votes. As professor and author James Honey, an expert on the activist, told USA Today in 2016: “This was the first holiday around a national figure who is not a president, and who is African American. Many in Congress did not want to recognise an African American that was thought of as a troublemaker by some in his day.” But despite many setbacks, the idea for the holiday refused to go away, vehemently championed by King’s widow, Coretta King Scott. After the 1979 defeat of the bill, Wonder wrote ‘Happy Birthday’ and included it on his Hotter Than July album of 1980. The Motown superstar held the Rally for Peace press conference in 1981, when the track came out as a single. Perhaps ironically for a song spearheading an American campaign, it enjoyed its biggest success internationally, climbing to No. 2 in the UK. In late 1983, Stevie and Coretta’s wishes were granted. President Ronald Reagan approved the holiday, to be observed on the third Monday in January each year. On 20 January 1986, as Americans observed the birthday of the great man with a holiday in his name, Martin Luther King, Jr. Day was celebrated for the first time, and Wonder headlined a major concert to mark the occasion.